Home / Studio Lighting / 1935 HOLLYWOOD 20TH CENTURY FOX STUDIO LIGHT. HUGE SCULPTURE ARTIFACT. DISPLAY ON FLOOR OR ON STAND. 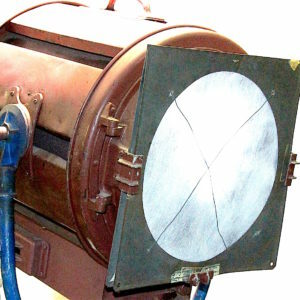 Submitted for your consideration, is this very rare motion picture carbon arc spotlight made in Hollywood, USA, Circa 1935 and sold new from The Mole Richardson Company in Hollywood, to 20th century Fox Film Corporation. It was part of their feature film department during the 1930s, 1940s and 1950s. 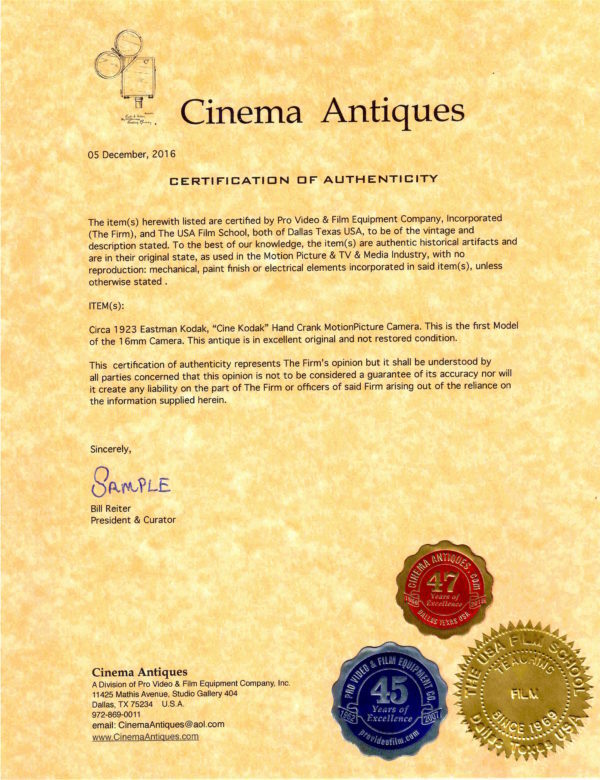 In a private collection for many decades and brought into our inventory in 2015. 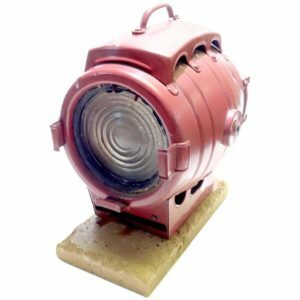 Sold in very original condition with fixture internals and externals intact, but UL Listed hardware converted to household lamp power for decorative display. Carbon Arc system is not working, by choice. Your choice of lamp for a perfect match for your display. 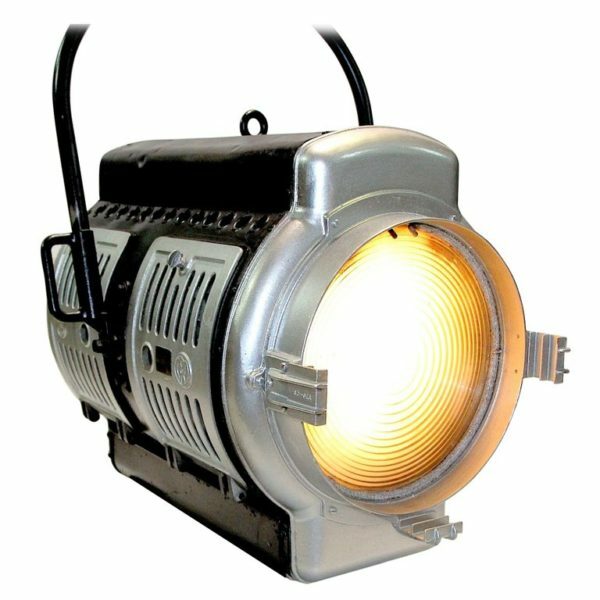 We like 2700 degree LED lamps for display. We have refinished the externals in factory correct colors and paint types. Original body patina remains for evidence of a rugged, exciting studio life, but this unit is extremely nice and presents beautifully. This large sculpture sized artifact from Hollywood is huge and heavy. Various light support stands (not included, but) available from stock. Go back and look at the motion pictures shot by Fox during this period and you will discover so many wonderful Hollywood Golden Age films produced, many with this light fixture. Our collection of these could very well be the last remaining correct Mole-Richardson Carbon Arc spotlights in existence and not in a permanent museum or studio owned display. Must be crated and shipped on a pallet or via blanket wrapped service on a household moving van. We are happy to help make all shipping and crating arrangements for our buyer. 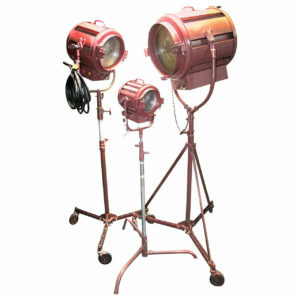 We also have the next size larger Carbon Arc Spotlight Fixture and crank up stand also formerly owned by Fox Studios in the 1930s. This freshly arrived fixture is currently unrestored. It is in our Dallas workshop now, being restored correctly and coming soon to our gallery. 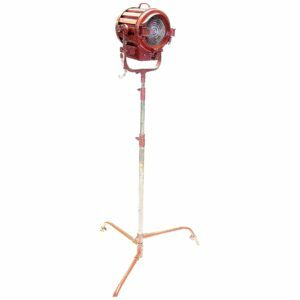 The larger fixture measures: Front to back: 37″; top to bottom: 47″; left to right: 33″. Weighs around 50% more than the smaller light. Please inquire on details and pricing. Own a true piece of Hollywood that has seen so many stars parading in front of its lens.